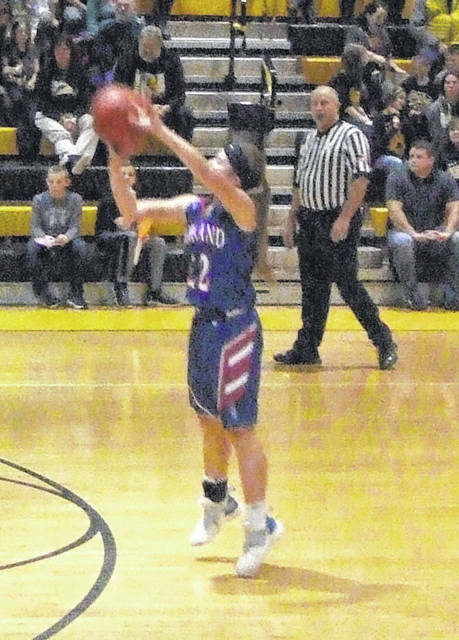 Madison Cecil scored 12 first-quarter points in leading Highland past host Northmor on Wednesday. Lexi Wenger puts up a shot over a pair of Highland defenders Wednesday. 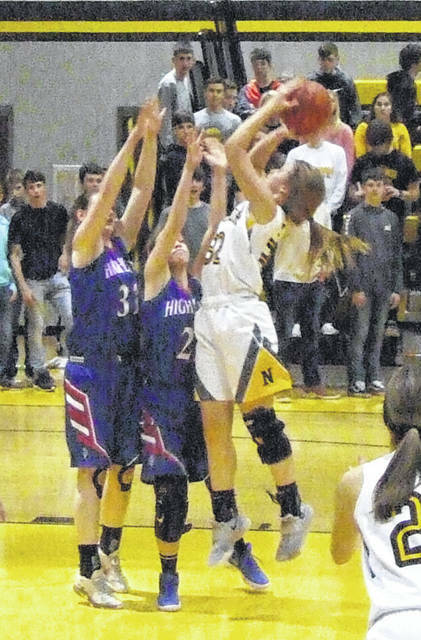 Highland rode a fast start to defeat Northmor by a 53-43 margin in a Wednesday night girls’ basketball game, spoiling senior night for the Golden Knights. Scot coach Whitney Levering Smith said her team used Senior Night as motivation in the game, as Northmor had done the same to her team last year by a 56-49 margin. Thanks to the shooting of Madison Cecil, they got off to a great start in the game. After Raven Tilford scored the first two points of the game for Highland, Cecil connected from three-point range and drew a foul. The successful free throw made it 6-0 and two more three-pointers by her helped the Scots lead by as much as an 18-7 score. Northmor got back-to-back baskets from Julianna Ditullio and Reagan Swihart to get within seven points, but Cecil ended the period with a successful shot as Highland led 20-11 after eight minutes. That was good for the Scots, as Northmor was able to work their way back into the game pretty quickly in the second quarter. After West tallied two points to put Highland up by 11, the Golden Knights got a bucket from Macy Miracle and two from Addie Farley to get within a 22-17 margin. They would get as close as four, but Highland was able to get a pair of West free throws to lead 27-21 at the intermission. Both teams would score 10 points in the third quarter to keep the Scot margin at six, but they would be able to widen their advantage in the fourth. West opened the period with a free throw and then added a basket to increase the lead to 40-31. Miracle connected from the field for Northmor, but Highland responded with shots by Cecil and West to boost their advantage to double digits. Trailing 49-38 with just under three minutes in regulation, Northmor attempted to rally, getting three free throws by Miracle and one from Farley to get within seven with one minute left, but they would give up four points at the foul line to Peyton Carpenter and Cecil down the stretch to seal the victory. While Northmor coach Freddie Beachy noted that he disagreed with some of the calls made on the night, he added that his team simply needs to be more accurate from the field. Ditullio finished with 12 to lead Northmor. Both Miracle and Lexi Wenger scored 10 and Farley added eight. Highland was led by Cecil’s game-high 18. Also, West tallied 13 points and Tilford contributed 12. Levering Smith noted that after frigid weather conditions had an effect on the team’s schedule last week, she’s hoping this win can spark them to a successful February.